Is your business faced with slippery surfaces that can cause a slip or fall? 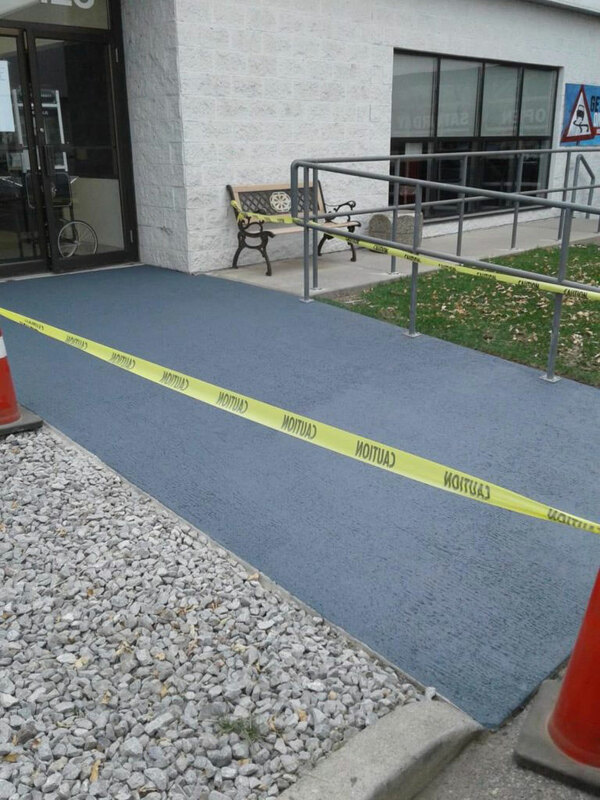 At EverLine Coatings we can eliminate the chances of a fall with the application of a non-slip specialty coating. Toronto is a city that experiences all kinds of crazy weather. Because of this, rain, snow, ice, and wet shoes can make things slippery for the people that use your property. Slippery surfaces can lead to some severe liability issues if someone slips, falls or injures themselves while on your property. To prevent this, the experts at EverLine Coatings and Services offer non-slip coatings in Toronto and the GTA to add some traction and safety to the surfaces on your property. If there are high-traffic or high-risk areas on your property and you would like to prevent accidents from occurring, one of EverLine’s Toronto anti-slip coatings is a great way to ensure that no one will slip, fall or injure themselves. Our Toronto non-slip floor coatings can be applied to a number of different surfaces and any dimensions that you may need them to be applied in. In addition to the added safety that one of our non-skid coatings provides, the EverLine coatings experts can also customize the colour of the coating so that your property will look great while remaining safe for everyone. 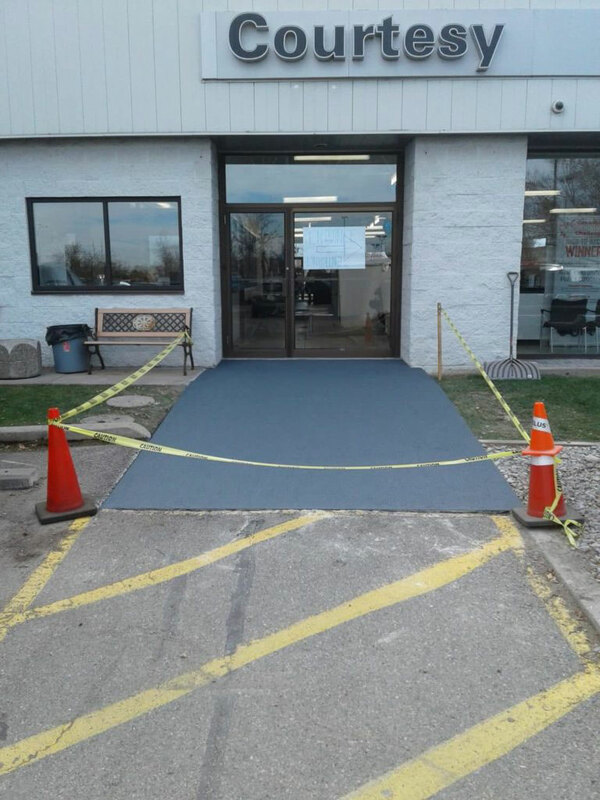 At EverLine Coatings and Services, we use the industry’s best non-slip coatings in Toronto. This helps us ensure that every anti-slip coating in Toronto that we apply is effective for the people that use your property and also ensures a good lifespan for the coating. If your business is looking to maintain its strong brand and wants to use specific colours, we can customize the colour of the coating to match the property or the brand of your business. That way, you will not be sacrificing aesthetics to improve the safety of your property with one of our non-skid coatings in Toronto. A significant contribution to our success with non-slip floor coatings in Toronto is our commitment to our unique CORE quality system. This quality system ensures that we are transparent with our clients and that we can exceed your expectations throughout every step of our Toronto non-slip coating projects. At EverLine Coatings and Services, we have been applying non-slip specialty coatings in Toronto for decades. In addition to our years of experience, we also regularly train our crews and provide them with the best coating application equipment and tools available. Between our experience and dedication to providing our clients with the best services possible, we have established ourselves as the non-slip coatings experts in Toronto. Our expertise begins with our rigorous training process that we use to educate our coating application specialists. Our thorough training programs ensure that our contractors have mastered the latest application techniques, that they understand how the products work, and that they can operate the application equipment to provide a perfect result every time. We evaluate the performance of each of our crew members and ensure that they are ready to deliver high-quality work to our clients before they are allowed to complete work for our clients. We hold regular training sessions with all of our crews to ensure that they are educated and understand the latest improvements and technology within the Toronto non-slip floor coating industry. If you hire Everline Coatings and Services to apply a non-slip floor coating in Toronto, you can be sure that your project will be completed by the best crews in the industry. If you will be having a Toronto anti-slip coating applied to your business in the near future, there are a few things you can do before our crews arrive to ensure a proper application that can be completed in a timely manner. First, please ensure that the surfaces that we will be applying a non-slip coating to have been cleaned and cleared of any debris that may exist. This will ensure that our non-skid coating will have a good bond for a great coating longevity and lifespan. Also, please put up signs and notices that our crews will be applying a non-slip floor coating to your surfaces. This will ensure the safety of our crews, that there are no unnecessary interruptions and that no one walks through the wet non-skid coating. If anyone walks through the wet anti-slip coating, it will ruin any work that our Toronto non-slip coating crews have completed. At EverLine, our coatings experts aim to provide the best value possible for our clients. We understand that no two Toronto non-slip coating projects are the same and they should not be treated as such. Because of this, we do not offer standard non-slip coating application packages. At EverLine, we work to understand your business, its needs, the scope of the project, and figure out all of the details to provide a price that delivers the best value possible for your unique needs. We understand that many factors could affect the cost of a Toronto non-slip coating project and we assess the project to determine how we can best serve every customer without exceeding their budget. If you would like a free quote for your upcoming Toronto non-slip specialty coating project, please contact us.